Read about the different things Texas Training & Conference Centers	has been in! The award was presented on the Heartbeat of America television series,	hosted by William Shatner. 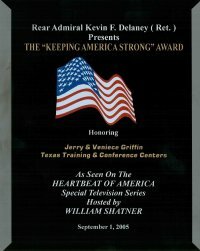 On September 1, 2005,	Texas Training and Conference Centers, was awarded The “Keeping America Strong Award”. Texas Training and Conference Centers was featured on a half hour episode	of the program. Jerry and Veniece Griffin were interviewed by Doug Lewellen	about the facility, how we got started, who are customers are, what sets	us apart from our competition, etc. The episode was aired nationwide during	the first week of December 2005.